A research based series of posts discussing the statement “Futures Research supports the Service Design process in multiple ways and throughout the whole process” by Minna Koskelo (LinkedIn) and Anu K. Nousiainen (Linkedin). Part #4: We are in the Service Innovation business! 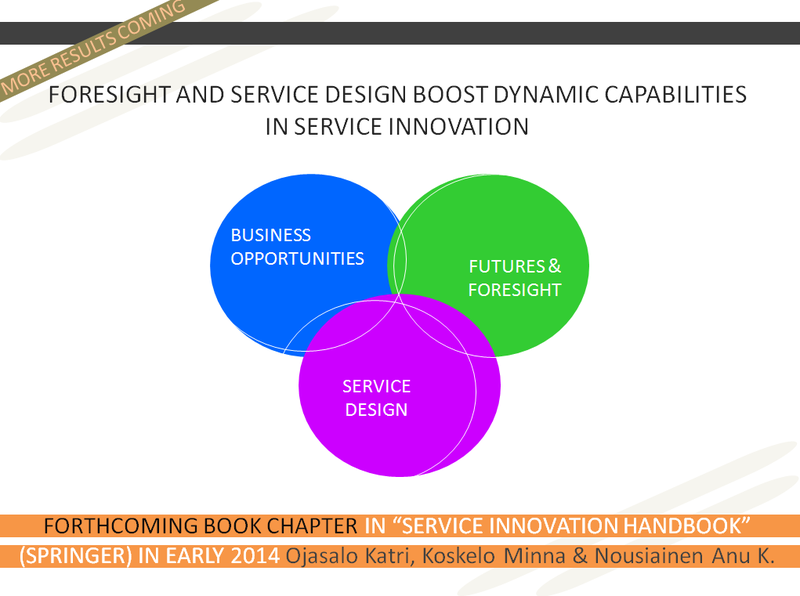 What we’ve done so far is not only about Futures enhanced Service Design – instead, this is the next chapter in building unique, synergistic and dynamic capabilities for Service Innovation. It has been clear from the beginning of our study that Design Thinking and Futures Thinking share a strong synergy in their principles and targets. Now it is crystal clear that by combining their unique approaches in innovation process results in bright and viable business opportunities (see process framework A. below). While Futures Thinking concentrates on driving forces in complex evolving systems and alternative contexts, Design Thinking embraces the viewpoint of system constraints and people oriented solutions. Not only this powerful combination gives you options for decision making in strategic and offering creation level but it tackles the two critical challenges in today’s (and tomorrow’s) business: Uncertainty and timing in creating Value Roadmaps in the interconnected and changing world. Here, Futures Thinking helps to make uncertainty easier to approach through providing alternatives for decision making and therefore improving organization’s readiness to act. Design Thinking improves the organization’s agility to seize the change with emphatic, adaptive and deep research approach and through iterative co-designing with customers to provide desirable, feasible and viable options for solutions. Our two previous blog entries have been summarizing the purpose of our study and the main findings including the synergies of service design and futures thinking, thus why it is beneficial for the two disciplines utilize approach and methods from one another and learn from each other. This third post introduces Service Design Process that is enhanced by futures thinking. Additionally we illustrate how service design thinking benefits foresight process.